During our 11th season of our game our office started getting calls from certain individuals that wanted to use one of our game platforms as a disguise for a wedding proposal. When I spoke to the very first gentleman that was thinking about this idea..the first thing I said to myself was "how the heck am I going to pull this off!" So I turned it down…then after I took his information and got to thinking about it after we both got off the phone.. I took out my sketch book out and suddenly found myself designing a game that would be solely customized to a wedding proposal. After a day I called that particular gentleman up..and I simply said that we are on! So after several weeks of customizing, scouting, designing, and planning the ultimate ending to this particular game …which was a wedding proposal..it was game day. Our client had brought some friends and family to play as well as his unsuspecting girlfriend..and they played what appeared to be a "typical" Cashunt. Forget the boyfriend being nervous…I was sweating bullets as if I was the one ready to propose. The only thought that kept coming into my head was …"what if she says no?" Luckily everything went smoothly..she said yes, everybody enjoy the competition of the game, and ultimately the ending was really the "icing on the cake". Now at the time we were well into our 11th year of doing our games and this was the first time we had received that type of call, but oddly enough after that event had passed the phone started to ring requesting the same thing! We did 5 wedding proposal games that year and after they were done I simply said…no more.. It was way too nerve racking (mind you all the girls had said yes) but let me tell you as a coordinator my blood pressure must have been through the roof one each one! We have a lot of fun games and surprises in store in Season 13! Teambuilding game to get "JUMBO SIZED"
When it comes to our games we always like to keep adding more to them year after year to give our new players and returning players the ultimate experience. This year we have really retooled our Teambuilding game that we offer to our new and returning corporate clients. The biggest challenge when it comes to a returning corporate client is making it different on the fly and make it look ever so different from their last competition with us. It can be nerve racking but also a lot of fun at the same time delivering it. So as we do every year we reinvent ourselves and this year our team building game will be "jumbo sized" to give our players an overwhelming experience where they will not know what to do first..which will make the game ever so challenging and exciting. We are also going to make it a little longer from the past so instead of a 2hr game it will be 2 1/2 to 3hrs of playing time and also it will cover much more ground, giving our players a HUGE playing field. The "less is more" effect does not work with Cashunt..more is more, our players have spoken and we have listened. 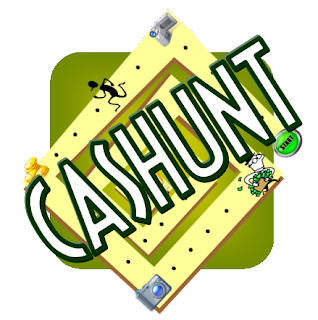 The elements of a Cashunt game will still hold true in our new team building product but will offer a lot more than what was normally offered. For example for years Cashunt has been a 6 challenge competition that any part of those 6 challenges can be played at anytime within the time that given. Now with the additional hidden challenges in the new game booklets, that can reach to 10 or even 11 challenges just in one game! In conclusion…it always about the experience and the execution, and that's what makes players come back for more. CASHUNT CHAMPIONSHIP XIII in "Havahd Squah"
This year's Championship will be held on October 27th and usually for the past 3 years we have held it in Salem Ma during Haunted Happenings which is always so much fun. But this year we are changing it up a little bit, we will be hosting the game in Harvard Square and the Back Bay area. What changed our mind was after researching the Harvard Square area for our new game "The Havad Yahd Dash" we thought it would be the ideal place to host our championship there because there is soooo much detail in that area alone. Also by including the Back Bay area it just expands the game so much more…the bigger the area the better. Turn your imagination into reality..with 3D Printing. I can't tell you how many times in the past 15 years when I am at some sort of gathering that I'm new to my surroundings, I feel funny but also different. You know how it goes you get to know the people around you no matter if it's a birthday, wedding, christening etc. and somewhere in the conversasion the ultimate question comes up…. "what do you do for a living?" When that question comes up in most circles you will hear….I'm in sales, construction, a nurse, a manager, secretary, attorney, etc..but when it comes to me and I say.."The scavenger hunt business" the music stops… "you are in what?! and you make money doing that that?" To my answers "scavenger hunt business and yes it is my career " Once I break that barrier to that question…there is this whole interest to further explore my profession which might lead into a contact. With all do respect all the other professions listed above..they are all fantastic occupations but in the end they are typical..people will not tend to further question what it is you do. But if you take a current profession and tweak it a bit and make it different…well that is a whole new ball of wax. It will be as if you have opened a new door..keep in mind mostly every profession can lead to a new and different road..which will make it more exciting and sometimes even... revolutanary. In order to be different you don't need to build a new wheel..you are just tweaking the one you are already rolling. If it isn't broke…sticking with what works for us. So here we are 2 weeks into our 13th season and the new design has been played by (handful of games / 10 different teams) and the result was positive…WHEW! As I had mentioned in the previous post about reinvention…it's always good to be fresh..but in the same instance (the "reinvention") has to work or it will backfire and then we will have a downslide. Fortunately other than a couple of suggestions about "additions" to the game..straight A's across the board! Thank you! Some people in the past have suggested to take the game more into the virtual world and have the game done all by smartphone. Look I know that exists and the companies that are using that platform are doing very well and more power to them…Cashunt is not that. The only tech aspect we are using on our game is only 10% and that is through QR codes..other than that it's all physical materials. Call us old school but I believe our clients still want their "host" and still want the physical materials that come along with the game..people still want to "touch" the product. Having people just download an app that you can play anywhere (no coordinator, materials, etc) and where you have to pay for it..is just not us. It all about the experience and the energy of the initial game, that make people talk about it, and I am saying that for everything that is a physical business be it tour, show, etc. First of all HAPPY NEW YEAR EVERYONE!!!! We hope you all enjoyed your holiday season, it's always a great time but it just goes by too fast.. So new year and for us new season, which we are excited about as you can imagine. With that said it's that time again for "reinvention", which has become an annual tradition here at Cashunt for the past several years. The goal is pretty simple…change some of the game and make it fresh which includes the game's foundation and design. So with that said I just looked at the new design and I am pleased and excited for this years version. You maybe be asking what is the difference from the past few years, (that question is usually brought up by repeat players that have played the game before). With out letting the "cat out of the bag" and sounding a tad vague, what we can tell you is that the game is no longer "6 challenges rolled into on zany game" it's much more than that! 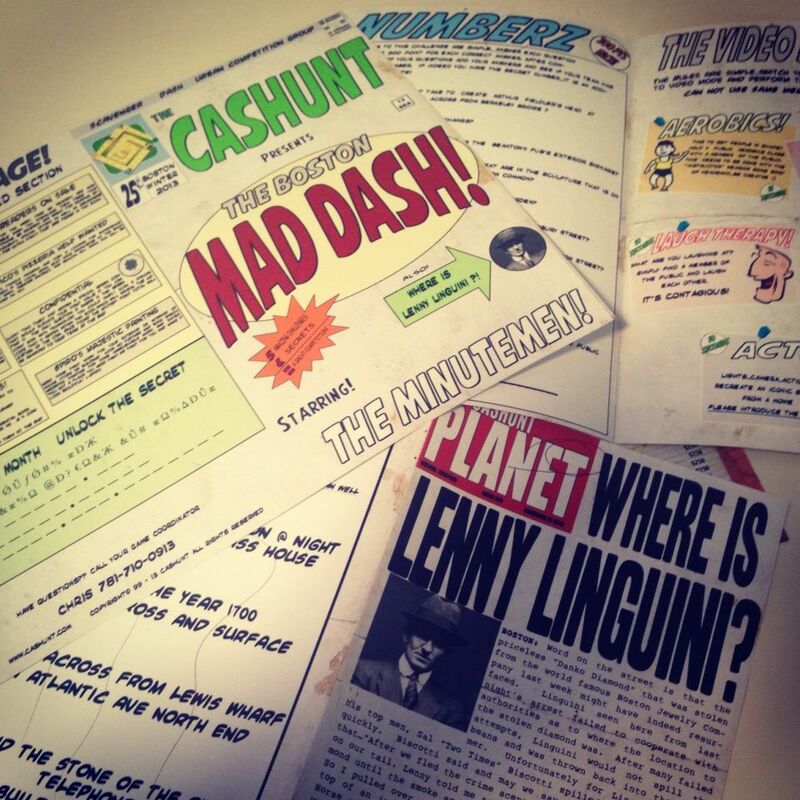 Last season we decided to experiment with the usage of QR codes and having the game books have more "depth" with the inclusion of the Cashunt website during an actual game. Also we really loved the idea of "secrets" that we included in our team game materials that would lead teams to new hidden challenges throughout the city. Let's say the experiment was a huge success and now has a pretty big presence in our games. The game book design for this season was inspired by the "silver age" comic time line of the 1960's. We really had a fun time putting the game book design together and added a lot of "double take" sections .. let's just say a couple of additional twists and turns :) Another thing we are keeping this season is by making the game booklets "valid" during the game season and can be used for some cool prizes for our quarterly promotions, throughout the year. Making the actual game booklet have a shelf life of 1 year. (Last year we gave away tickets to the Bruins, Celtics, Red Sox, and Revolution to some players taking advantage of their game booklets and these promotions). We would love to tell you more about it but we just …can't, but we are really happy with this season's end result. Our goal every year is to give our players "the wow factor" by the quality of the material, the product, and ultimately the experience…I think we have again achieved that once more! This game booklets will debut on Jan 6 to kick off Season 13!